Bob Maxwell was a harpist and composer who wrote several TV soundtracks, as well as appearing on variety shows. 06/27/1974 0111 Yesterday's Murder Determined to change her fate, a woman is granted the chance to go back in time to set her life in order. 08/22/1974 0138 The Case of M.J.H. A professional swindler seduces a lonely unmarried woman who works as a psychiatrist's assistant. He persuades her to pilfer her employer's patient files in order to extort money from them. 10/24/1974 0165 A Cage for Augie Karo A seasoned thief discovers a way to pull off the perfect crime while in jail. A fellow prisoner hands him a special chemical that will allow him to sleep for centuries. But has he calculated how the world around him will change with the passage of time? 12/09/1974 0184 The Fatal Connection A young couple expecting a child also happen to inherit a furnished house. Among their acquired furniture is a phone that can send them back in time to relive the lives of their ancestors. They slowly realize that their ancestors were not very nice. 03/28/1975 0247 Key to Murder A double bill of the classic Poe plot. An investigator probes the case of two murders that took place in rooms sealed from the inside with no other visible entrances or exits. 05/02/1975 0267 The Final Witness An average Joe becomes the accidental witness to the murder of a friend. But his nerves fail him in the witness stand and the murderer is acquitted. Soon after his friend starts paying visits much to his horror and only extreme steps will appease his spirit. 05/30/1975 0283 Someday I'll Find You Ann Markle's husband is presumed dead in a cave-in. But just as she recovers from the trauma, she finds a recent painting by him in a flea market in Mexico. She decides to undertake a cross-country hike to get back her amnesiac husband. 08/13/1975 0325 The Master Computer In a fully automated world, a couple come home from vacation to find that their existence has been wiped clean from society's records. The culprit that disrupted their lives is later revealed to be a computer glitch. 10/02/1975 0357 The Man Who Ran Away Devastated by the discovery of his wife's infidelity, a man seeks refuge in a nearby town. He comes across a seemingly run-down estate and intends to drown his sorrows in solitude. However, he is surprised to find that the house occupied by a lady just as lonely as he is. 12/02/1977 0749 Neatness Counts An investigator ends up with the unfortunate duty of solving the murder mystery about a man so universally panned that each and every person he knew in his lifetime could be a suspect. 10/06/1980 1124 Second Sight In order to evade capture during an attempted robbery of a wealthy man, Arthur Dickson aka Fingers accidentally blinds the detective leading the task force. Dickson is later charged with murder when the millionaire turns up dead. The blind detective comes out of retirement to once again work on the case, this time he believes Dickson's claims of innocence and sets out to exonerate him. 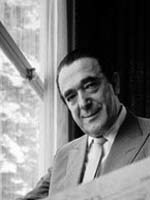 I don’t think you picture is the right Robert Maxwell - that’s the disgraced British publishing baron Robert Maxwell. The photo you show is not of Robert Maxwell, the actor. Your photo is of corrupt UK newspaper tycoon Robert Maxwell, who misappropriated pension funds, was totally dishonest, and died when he fell off his yacht - no kidding. Robert Maxwell (born Max Rosen; April 19, 1921 – February 7, 2012) was a harpist and songwriter, who wrote the music for two well-known songs: "Ebb Tide" and "Shangri-La" (originally a composition entitled "Fantasy for Harp"). He also wrote "Solfeggio", used in a repeated skit by entertainment television innovator Ernie Kovacs.